(a) ADMINISTRATIVE DISMISSAL means dismissal of an action for delay (including, without limitation, through breach of an order, direction or timetable), or by reason of abandonment pursuant to Rules 48.14 or 48.15 of the Rules of Civil Procedure, R.R.O. 1990, Regulation 194, as amended or as may be provided in equivalent successor legislation. (b) CANADIAN FINANCIAL INSTITUTION means a “Canadian financial institution” as defined under the Bank Act, S.C. 1991, c.46, but does not include an entity that is primarily engaged in dealing in securities, including portfolio management and investment counselling. (c) CIVIL SUIT means an action, application or arbitration in which a CLAIM for DAMAGES is asserted against an INSURED. received by the INSURED and resulting from a single error, omission or negligent act or RELATED ERROR(S), OMISSION(S) OR NEGLIGENT ACT(S) in the performance of PROFESSIONAL SERVICES. All CLAIMS, or circumstances of an error, omission or negligent act which any reasonable LAWYER or LAW FIRM would expect to subsequently give rise to a CLAIM, which arise from a single error, omission or negligent act or RELATED ERROR(S), OMISSION(S) OR NEGLIGENT ACT(S), shall be deemed a single CLAIM regardless of the number of INSUREDS or the number of persons or organizations making a CLAIM or the time or times the error(s), omission(s), negligent act(s) or CLAIM(S) took place. (e) COMBINED LICENSEE FIRM(S) means a partnership, other than a MULTI-DISCIPLINE PARTNERSHIP, or a professional corporation, which pursuant to By-Law 6 of the Law Society Act, R.S.O. 1990, c.L.8. (“Law Society Act“) has one or more PARALEGAL partners or shareholders and one or more LAWYER partners or shareholders. (f) COMPUTER SYSTEM(S) means any electronic device, component, network or system, or any protocol, portal, storage device, media, or electronic document, or any computer software, firmware or microcode, or any associated technology which receives, processes, stores, transmits or retrieves data either locally or remotely, or any part thereof, whether stand-alone, interconnected or operating as part of an integrated system or process, for use by or on behalf of the INSURED and/or the INSURED’S LAW FIRM. (h) COUNTERFEIT CERTIFIED CHEQUE(S) OR COUNTERFEIT BANK DRAFT(S) means a fake instrument purported to be drawn upon a CANADIAN FINANCIAL INSTITUTION that resembles a certified cheque or bank draft to such an extent that it is reasonably capable of passing for a certified cheque or bank draft, but not a certified cheque or bank draft that has merely been altered and/or signature of endorsement forged. (i) CYBERCRIME(S) means an incursion, intrusion, penetration, impairment, use or attack of a COMPUTER SYSTEM(S) by electronic means by a third party, other than the INSURED or the INSURED’S LAW FIRM. (iii) punitive damages, exemplary damages, or aggravated damages, and any interest thereon. (k) DEDUCTIBLE(S) means that amount set out in ITEM 7 of the Declarations, subject to Part IV Condition C, and shall be the responsibility of the INSURED and the partner(s) and/or shareholder(s) of the LAW FIRM in which the INSURED practises as of the date of the CLAIM. (iii) unless otherwise indicated in ITEM 7 of the Declarations, to investigation and/or defense expenses and costs as described in Part 1 Coverage C, to the extent incurred upon final resolution and successful defence of the matter. (l) DESIGNATED AGENCY(IES) means those EMPLOYER(S) designated as such by the INSURER while listed on its website at lawpro.ca/Designated_Agencies. and which may occur in the absence of an INSURED’S actual dishonest purpose, motive or intent. (n) EMPLOYEE(S) means a person who provides PROFESSIONAL SERVICES for one EMPLOYER only, whether under a contract of service or a contract for services. PROFESSIONAL SERVICES are provided on a pro bono basis. (p) INJURY means bodily injury, false arrest, wrongful detention or imprisonment, libel, slander, defamation of character, invasion or violation of privacy, assault, battery, harassment, discrimination or wrongful dismissal. (q) INSURED(S) means both NAMED LAWYER(S) and UNNAMED LAWYER(S). (iv) each LAW CORPORATION, and its officer(s), director(s), shareholder(s) and/or employee(s) who are LAWYERS, but only with respect to the rendering of PROFESSIONAL SERVICES by the officer(s), director(s), shareholder(s) and/or employee(s) of such LAW CORPORATION who are INSURED(S) under this POLICY and named in ITEM 1 of the Declarations as INSURED(S), and then only to the extent of coverage afforded to such officer(s), director(s), shareholders and/or employee(s) in their respective capacities as such. Such LAWYERS, however, who during the POLICY PERIOD become deceased, suspended or disbarred, resign from The Law Society of Ontario, become a judge or retired, or become exempt or eligible for exemption from the payment of insurance premium levies pursuant to the by-laws of the Law Society Act, or cease for any reason to be a LAWYER, will instead be considered to be an UNNAMED LAWYER for the remaining period in time that the POLICY is in force, unless that LAWYER (or legal representative on behalf of the LAWYER) subsequently reapplies for coverage and is then named in the Declarations for that remaining period in time that the POLICY is in force. UNNAMED LAWYER(S) means each LAWYER and former LAWYER, as well as each former member of The Law Society of Ontario immediately before May 1, 2007, who has not applied for coverage and is not named in the Declarations. (r) INSURER means Lawyers’ Professional Indemnity Company. (s) LAW CORPORATION(S) means a professional corporation incorporated under the Business Corporations Act, R.S.O. 1990, c.B.16 for which practice is governed and a valid certificate of authorization issued under the Law Society Act. (t) LAW FIRM(S) means a law firm, including a sole proprietorship, association, LAW PARTNERSHIP or LAW CORPORATION, and shall include any former and successor firms thereof, but does not mean a PERSONAL LAW CORPORATION. (u) LAW PARTNERSHIP(S) means a law partnership, in such form(s) permitted by The Law Society of Ontario, including a MULTI-DISCIPLINE PARTNERSHIP or a COMBINED LICENSEE FIRM which has PARALEGAL partner(s). (v) LAWYER(S) means each person who holds a Class L1 licence pursuant to the by-laws of the Law Society Act. (w) LOCUM(S) means a PRACTISING LAWYER who substitutes for another LAWYER, on a temporary basis, in the performance of PROFESSIONAL SERVICES for the clients of the other LAWYER or the other LAWYER’S LAW FIRM. For the purposes of such work, the LOCUM is deemed to be a member of the LAW FIRM to which the other LAWYER belongs. (ii)in respect of services performed on or after July 1, 2008, a person performing services for which a licence is required under the Mortgage Brokerages, Lenders and Administrators Act, 2006, S.O. 2006, c.29. and which may include one or more PARALEGAL partners. (z) OVERDRAFT means a negative balance in the INSURED’S trust account to the extent directly caused by a COUNTERFEIT CERTIFIED CHEQUE(S) OR COUNTERFEIT BANK DRAFT(S). (aa) PARALEGAL(S) means each person who holds a Class P1 licence pursuant to the by-laws of the Law Society Act. practice in a LAW FIRM (other than the LAW CORPORATION) as more fully described in question 6 of the 2018 Application Form for this insurance. (cc) POLICY means this policy numbered 2018-001 issued by the INSURER to the NAMED INSURED, as well as any related application and exemption forms including attachments, as well as Declarations pages, endorsements and forms issued by the INSURER. (dd) means a LAWYER who is engaged in the practice of law and is not exempt from the payment of insurance premium levies pursuant to the by-laws of the Law Society Act or suspended from the practice of law in Ontario, and shall include LAWYERS while employed exclusively by one or more DESIGNATED AGENCY(IES) before January 1, 2017.
after January 1, 2003, pursuant to section 163.2 or section 237.3 of the Income Tax Act, R.S.C. 1985, c.1 or section 285.1 of the Excise Tax Act, R.S.C. 1985, c. E-15. (ff) PRO BONO SERVICE(S) means approved pro bono PROFESSIONAL SERVICES provided by the INSURED after January 1, 2003, through an approved pro bono PROFESSIONAL SERVICES program, where the approved pro bono PROFESSIONAL SERVICES and PROFESSIONAL SERVICES program are approved by the INSURER in advance in writing. subject to Part II Special Provision A; and shall include, without restricting the generality of the foregoing, those services for which the INSURED is responsible as a LAWYER arising out of such INSURED’S activity as a trustee, administrator, executor, arbitrator, mediator, patent or trademark agent. 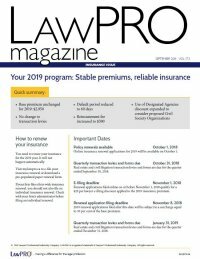 (ii) RECIPROCATING JURISDICTION’S(S’) POLICY(IES) means the mandatory professional liability insurance program policy(ies) for lawyers of the law society of a RECIPROCATING JURISDICTION. (jj) RELATED ERROR(S), OMISSION(S) OR NEGLIGENT ACT(S) means error(s), omission(s) and/or negligent act(s) that have any common facts, circumstances, situations, events, transactions, causes and/or series of causally or otherwise connected facts, circumstances, situations, events, transactions, and/or causes, including, without limitation, negligent supervision of others and/or vicarious liability for the error(s), omission(s) and/or negligent act(s) of others. (kk) SECONDED LAWYER(S) means an INSURED who is a member of a LAW FIRM, but who temporarily acts in the capacity of in-house corporate counsel for a CORPORATE EMPLOYER. (ll) SOLE PRACTITIONER(S) means a LAWYER who practises on the LAWYER’S own, without LAWYER partner(s), LAWYER associate(s), PARALEGAL partner(s) or shareholder(s), or employed LAWYER(S), and without other LAWYER(S) practising in a LAW CORPORATION.